We live on an island in WA State, Fox Island, near Gig Harbor, 45 miles SW of Seattle. Anne is a former English/Spanish teacher and deposition court reporter, and Wes is a former elementary teacher and director of instructional technology in Tacoma Public Schools, the same district where he went to school. Papakea Resort has been special to me, Anne, since I first rented there in 1979 when I was teaching English. A student's parents owned a unit there. I had lived on O'ahu as a child, and the spirit of Aloha was everywhere for me on Maui. Papakea soon became an annual vacation spot. Wes and I married in 1997, and we bought our condo in 1998. It is our second home now, and we want your visits to be special, comfortable, and memorable in the very best ways. 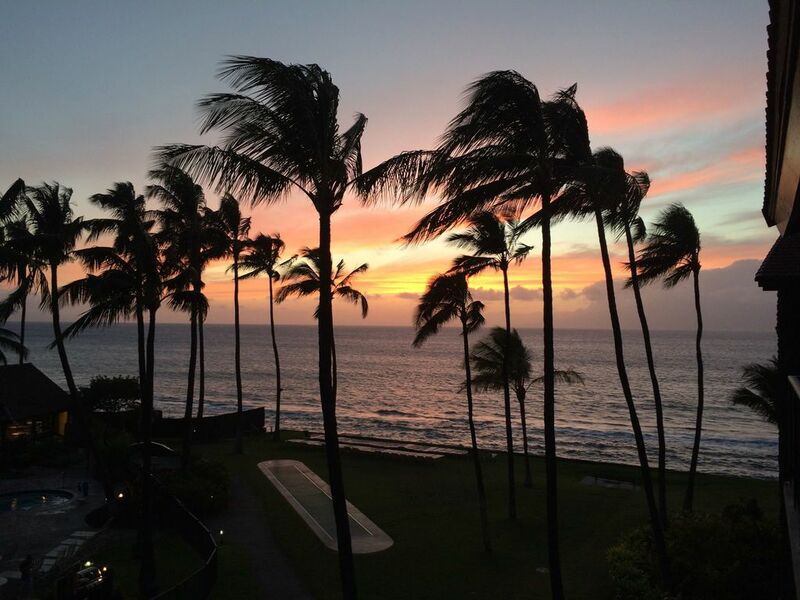 Papakea is an oasis, a relaxing and beautiful place that is the perfect base for exploring all the possibilities on Maui. It has so many wonderful amenities and a very nurturing atmosphere. Three-time guests said it is their sanctuary and retreat. toilet, shower, Glass block shower for two. toilet, shower, River-rock shower bottom. From our lanai, you can see the ocean, pool/Jacuzzi area/ putting green/gardens and koi ponds/the West Maui Mountains. Each unit receives one parking pass, and the guest can choose where to park. Additional passes are $5/day. All linens provided, including large beach towels. Large living room with cathedral ceiling and mirrored wall to reflect the ocean and pool area; 10-ft. opening onto the lanai by sliding open our six-panel wall of glass. New flatware and sharp knives for food preparation; large Kitchen Aid blender; pull-out shelves in all lower cabinets, rice cooker, wok, storage containers, cupcake pan, cookie trays. Large, new, high lanai furniture with 180-degree swivel chairs. (2) Both are flat-screen. There is a Blu-ray DVD player in the living room. In both the living room and the master bedroom. There is a free book exchange up in the loft closet and also in the front office. Guests always leave assorted boogie boards, snorkeling equipment, beach toys, umbrellas, and coolers. Check what's there before buying any. Check to see what's in the condo before you purchase anything because guests leave many items for future guests. You can get excellent equipment for snorkeling at Snorkel Bob's behind Papakea. Three tennis courts are provided for guests. There are two pool areas at Papakea, both with large Jacuzzis. High-speed Wireless Internet provided at no cost, Two Cable TVs, Blu-ray DVD, Ceramic Topped Stove, Coffee Maker, Toaster, Blender, Bosch Washer/Dryer in-unit, Two Hair Dryers in Bathrooms, Full-size, side-by-side refrigerator, Tri-zone AC system with units in LR/kitchen/dining area, master BR, and loft BR. Ziplines, ATV riding, horseback riding, whale watching trips, blowholes, hiking, aquarium.